If you like them to, you must try this collard greens recipe. This vegetable recipe has a slight spin on it being that it's a healthy recipe. For this greens recipe I use smoked turkey instead of smoked ham hocks, fat back, or bacon. 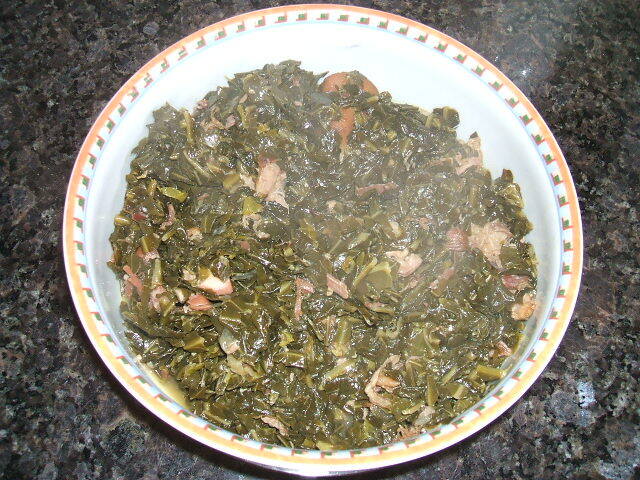 Now you might be thinking that collard greens will not taste right without the smoked ham hock? However, that's just not true. Cooking with turkey will also provide enough flavor to the greens to make them tasty. Don't knock this recipe until you try it. Just give the recipe a try and I'm sure you will be pleasantly surprised at the awesome taste. Even better, you can easily master this recipe and prepare greens for many years to come. Rinse collards greens in the sink under running cold water. Pick greens away from the stem. Stack collard greens into several leaves on top of each other. Using a cutting board and knife, roll the leaves together and cut collard green leaves into 1 inch thick strips. In a small pot boil turkey necks (or turkey wings) over medium-high heat until tender. Once turkey parts are tender rinse and transfer to the pot containing your collard greens. In separate large pot, heat equal amounts of water and chicken broth. Add greens, bring to boil, then reduce heat to simmer. Next add diced red onions, garlic and olive oil. Cover with lid and continue to simmer for 1-1/2 hours. Once greens are tender add salt and pepper to taste. Throughout cooking continue to add equal amounts of water and broth. Serve cooked greens with your favorite meat, side dishes and corn bread.